Welcome to the Spring 2019 UK-QSAR Newsletter! 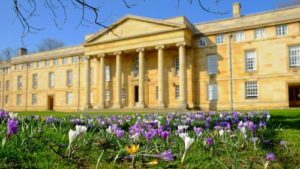 We’re looking forward to the upcoming Spring Meeting, which will take place in Downing College, Cambridge on Thursday 4th April 2019. More details are below. The meeting is currently full, so if you would like to be added to the waiting list for a spot then please email richard.hall@astx.com. As the meeting is currently oversubscribed PLEASE LET US KNOW if you can no longer attend so that we can release your place. Downing College should provide an excellent backdrop for the meeting, being centrally located whilst surrounded by 20 acres of grounds. Some information on the college can be found below. Some of the speakers have kindly suggested some background reading material which may be of interest ahead of the meeting. We look forward to seeing you in Cambridge in April, or at the Autumn Meeting, which is scheduled for 26th September in Nottingham. The UKQSAR Spring 2019 will take place in the Howard Theatre at Downing College, Cambridge, CB2 1DQ on Thursday 4th April 2019. The event is hosted by Astex Pharmaceuticals and is themed around structure-based drug discovery. Downing College is located in the centre of Cambridge and Cambridge Railway Station is just 15 minutes’ walk away. If you are travelling by car, Cambridge park and ride has free parking, and buses to the city centre cost three pounds for a return ticket – see http://cambridgeparkandride.info/index.shtml for more details. Cambridge Bus Station is 10 minutes’ walk from Downing College. Extremely limited car parking is offered by invitation only – please contact richard.hall@astx.com for more details. If you require overnight accommodation please have a look at https://www.visitcambridge.org/accommodation for details of hotels in the city centre, or https://www.universityrooms.com/en-GB/city/Cambridge if you’d consider staying in nearby college accommodation. There will be an informal dinner and drinks (self funded) in central Cambridge on Wednesday 3rd April (the evening before the meeting) – please contact richard.hall@astx.com for more details. Downing College was founded in 1800 by a bequest from Sir George Downing, using inherited wealth from his grandfather, who not only built 10 Downing Street, but also served under both Cromwell & Charles II. Sir George had no direct heirs (since his child bride refused to live with him, instead opting to serve as a Maid of Honour to Queen Anne) and left his estate to his cousin, Jacob. After much legal dispute, eventually the family allowed the bequest to be used to set up the college, and it was granted a Royal Charter in 1800. 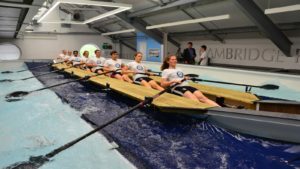 Now the college not only boasts an impressive 20 acres of gardens & grounds, bang in the centre of Cambridge, but it has recently become home to the Cambridge Rowing Tank, which is open to all rowing clubs and schools in and around Cambridge. The tank can hold up to 8 rowers, and comprises two 50-feet pools (one on each side of the “boat”) and is set up with live-streaming video cameras to allow the rowers to observe their technique as they row. Downing rowers appear make good use of the facility as both their men’s and women’s teams sit near the top of Division 1 in the University Bumps competitions. Alumni of the college include Andy Hamilton, John Cleese & Brian Redhead.